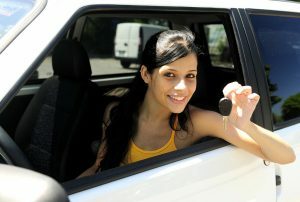 My friend Jenny was always losing her keys. Coming out of the mall, she could never remember where she parked her car. whenever Jenny went to a party, she’d meet someone new. Then minutes later couldn’t recall their name. This embarrassing, nagging, ongoing memory problem had Jenny worried sick. Until I told her about Vinpocetine. First isolated from the lesser periwinkle plant in 1975 by Hungarian chemist Csaba Szántay. Vinpocetine boosts blood flow in the brain. And has now helped countless people around the world improve alertness, cognition, concentration, memory and mood. Jenny has been using Vinpocetine every day since I mentioned it to her. And she loves it. Jenny no longer loses her keys. She can go to the mall and come out later knowing exactly where she parked her car. She can even recall the name of the last person she met. So what did Jenny do? I’m sharing Jenny’s story with you – not because it’s unique. … that Jenny could simply choose another supplement to support her memory. And all the gains she got from using Vinpocetine every day were not lost. It seems to be a major kink in our human operating system ..
… not realizing another solution could be around the corner. And even better than the last. That’s when Jenny discovered she had other ways to boost the blood flow in her brain. All it took was one panic-stricken phone call. And Jenny learned about Picamilon and Pine Bark Extract. Both nootropic supplements help increase blood flow in the brain. Pine Bark Extract does it by increasing nitric oxide which helps dilate blood vessels. It even helps repair and maintain blood vessel lining health. Then there’s Picamilon. Developed in Russia in 1969, Picamilon is a combination of the inhibitory neurotransmitter GABA with Vitamin B3 (niacin). Jenny couldn’t get Picamilon at her local vitamin shop. But she had several options for Pine Bark Extract. … and her memory continues to get better every day. … how do you choose the best one? My friend Jenny is not alone in knowing she has a problem with her brain. Then jumping at the first option that crossed her radar. It could be an ad on TV. An email from a friend. A share on Facebook. An article in a magazine. Hope for a solution to boost memory or motivation. A proven way to tame anxiety or relieve depression. My name is David Tomen. And I’m author of NootropicsExpert.com. I faced the same dilemma as Jenny several years ago. Problems with my brain. And desperate for a solution. About 10 years ago I was diagnosed Adult ADD. Up to then I had no idea why I had problems with focus all my adult life. I bought and read dozens of self-help books on how to focus. I was depressed. Lost promotions because yearly management reviews said I wasn’t “focused”. Then I ended up in the ER. What my wife feared was a heart attack turned out to be hypothyroidism. A non-functioning thyroid came with chronic fatigue syndrome, severe brain fog, memory loss, fibromyalgia, chronic pain, and adrenal fatigue. We endured endless visits to specialists and hospitals including the Cleveland Clinic. This during episodes of forgetting dates and appointments, a failing business, a crumbling marriage, doctors, endocrinologists, neuroscience specialists and therapists. 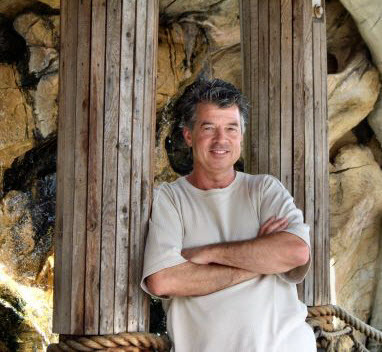 Two different neurologists tested me for dementia, and early-onset Alzheimer’s. Test results gave no indication of either Alzheimer’s or dementia. But clearly my brain was not working like it should. The medical bills kept stacking up, and the doctors had all but given up. There was nothing wrong with me according to mainstream medicine! But my life was falling apart and I had to make a decision. Either figure this thing out. Or give up and die. Out of sheer desperation I searched the medical databases, blogs, websites, stacks of books and combed the forums. For years I dug and I searched. Experimented with every kind of so-called “alternative” remedy I could find. And gradually, I got my life back. My memory came back online. Depression and anxiety faded away. Happiness peaked out from behind the dark clouds of despair. Now I have a thriving business. The relationship with the love of my life is better than the day we married. I bounce out of bed at 5 a.m. to meditate for an hour. Take my nootropic supplements. And look forward to another productive day. Now to be honest, it took more than a stack of supplements to turn things around. It took a lifestyle change with better food, some exercise and an attitude change. But nootropic supplements were at the heart of this miraculous turn-around. I figured out what my body and brain needed to repair and then maintain what felt like a younger version of me. And I continue to tweak and refine every area of my brain and cognition. I wrote a book that could be your way back. The first authoritative book on the healing power of nootropic supplements written in the last 20 years! Nootropics and neuroscience are finally coming of age. Researchers and ordinary neurohackers just like us are beginning to understand a lot about the brain. And we’ve found that you can literally turn your life around if you take care of your Head First! Head First – The Complete Guide to Healing and Optimizing Your Brain with Nootropic Supplements. Two years ago I began sharing what I learned about repairing and optimizing the brain on NootropicsExpert.com. It soon became apparent to me that people around the world were searching for answers. Real, honest, in-depth answers on how to fix memory, anxiety, depression, OCD, and a host of other cognitive problems. Then calls and emails from people like Jenny began to come in. Needing advice of brain health and repair. So the next obvious step for me was to share what I’ve learned and continue to research as a book. 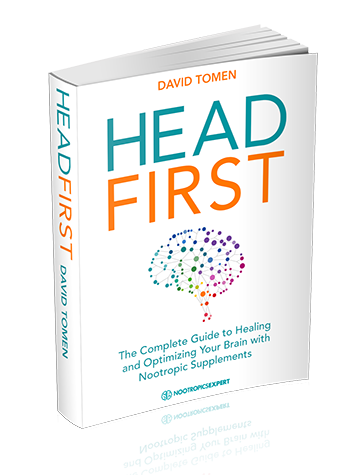 The book Head First begins with my story and what led me to want to share what I discovered about brain health and nootropic supplements with the world. You begin with a clear understanding of what is possible with dietary supplements. That there is no single “magic pill” able to fix all that distresses the broken brain. The next chapter explains in plain, easy-to-understand English how your brain works. What can go wrong. And the how and why a wisely chosen nootropic supplement can correct that problem. This is not like some pulp, glossy magazine you’d find in the supermarket checkout line. But it’s not a dry, boring textbook either. You get real, actionable tips right from the start. Anxiety & Stress – A snapshot of the nootropic supplements that reduce anxiety and stress. Pg. 29 And then find out how chronic stress permanently degrades brain function. Here you find out about the ancient herbal remedy that reverses the brain damage caused by stress. Pg. 70. Which Nootropic Supplement is Best? The next major section of Head First investigates all of the most popular nootropic supplements available today. Dietary supplements that it may never have occurred to you were great cognitive enhancers! Nootropic supplements that you can get today from your local vitamin shop or health food store. Each review reveals where the supplement came from, and why it is used for cognitive health. Each nootropic review provides an in-depth analysis on how the supplement works in your brain. What can go wrong in your brain. And how that nootropic addresses those problems. The review also includes a section on how the supplement feels when you take it. Detailed dosage instructions based on clinical studies and user experience. You then learn the possible side effects and drug interactions to watch out for. You also learn the best form of that nootropic supplement to buy and use. So there’s no confusion on which one to add to your shopping cart. I have no doubt you’ll be amazed as you discover what some of these nootropic supplements can do. Bipolar Disorder – This triad of nootropics when used together have a profound effect on taming bipolar disorder and improving mood. Pg. 41. I’ve often wondered how my life would have been different if I’d been diagnosed ADD early in life. What would it have been like had I not struggled with lack of focus and muddled thinking for most of my career. Maybe my intelligence and built-in work ethic would have put me in the executive offices as CEO of a major corporation. But I’ll never know. Because I was undiagnosed ADD. What about your child? Naturally, you want your kid to have every advantage in life. The ability to reach heights you never did. Unfortunately, more and more children are being diagnosed ADHD or ADD. Mainstream medicine prescribes potent stimulant drugs that may or may not cause long-term harm to your child. The promise of nootropic supplements is not just for those of us with ADHD or memory problems or depression. Some of these dietary supplements even make music sound better. Your vision sharper and colors more vivid. I believe you’ll be amazed like I was on how long some of these compounds have been used by humans. Ancient texts have revealed a plant called Coleus forskohlii, native to India, Burma and Thailand, has been used for thousands of years to treat heart disease, convulsions, spasms and painful urination. The study was a meta-analysis of the FDA database of controlled trials used in the initial approval of the most popular antidepressants. The side effects of the majority of the SSRI’s, MAOI’s, and benzodiazepines are not only bad. They are often absolutely horrific. I don’t use antidepressants because they literally make me feel sick. And after seeing the evidence time and again on the side effects produced by these drugs. I don’t want to use them. And I certainly don’t want anyone in my family or friends using them. Fortunately, we have much safer and very effective ways of treating the symptoms of anxiety, depression, OCD and other mood disorders. With all of the natural and safer alternatives to anti-anxiety, antidepressant and other anti-psychotic meds – why play with fire? 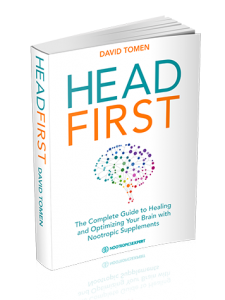 Get your copy of Head First – The Complete Guide to Healing & Optimizing Your Brain with Nootropic Supplements right now. And learn how you can lift your mood and tame anxiety simply by choosing the right nootropic supplement. A lot of what we do with nootropic supplements seem to affect dopamine levels in our brain. Which comes as no surprise I’m sure. Dopamine is the “feel good” neurotransmitter. It’s what controls the reward and pleasure centers in our brain. Dopamine regulates the way we move our bodies, and affects our emotional responses. But problems with dopamine manifests as Parkinson’s and other debilitating diseases. Turns out that several nootropic supplements reviewed in depth in Head First affect dopamine. You’ll find one of them on Page 283 that naturally boosts dopamine synthesis. Wipe Out Brain Fog – Absolutely required for the synthesis of RNA and DNA in brain cell mitochondria. This nootropic is required for optimal cognition and brain performance. Pg. 252. Dr. Giurgea first synthesized Piracetam back in 1964 while working at the Belgian-based pharmaceutical company UCB Pharma. Piracetam was created to help treat motion sickness. Surprisingly, Piracetam proved very successful in enhancing overall mental performance, memory and cognition. A first for a lab-created synthetic compound. At least 19 racetams have been developed in the last 50 years. Each racetam shares a 2-Pyrrolidone base structure. But each are unique in their mechanism of action in your brain. Nootropic supplements can help increase your memory, boost learning ability, improve your mood and assist overall brain function. 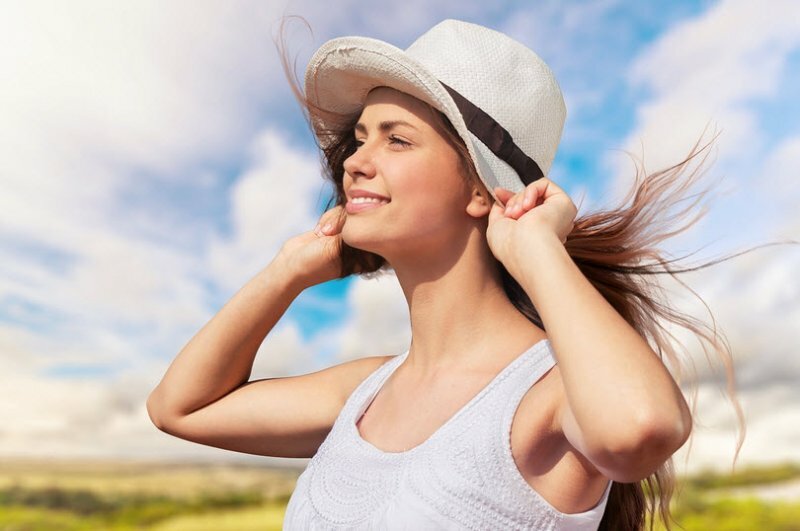 Some nootropics are anti-aging and will help reverse the damage caused by toxins, environmental pollution, disease, poor blood flow and simply getting older. And other nootropic supplements have been shown to be effective in stopping, and even reversing neurodegenerative diseases like Alzheimer’s, Parkinson’s, Huntington’s and more. 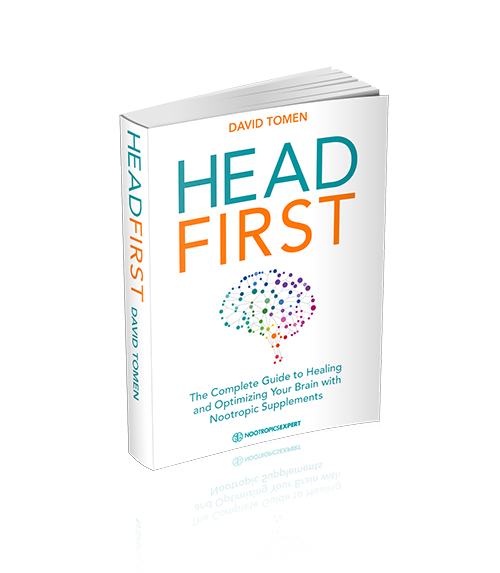 Head First is your guide to helping you repair and optimize your brain. For a healthier, happier and better quality of life. Now you don’t have to search endlessly for information on the next nootropic supplement you’d like to try. No more scanning site after site and old books for information on side effects and dosages. In Head First, you’ll discover 72 of the most popular nootropic supplements used in the world today. Each nootropic review provides exactly what the nootropic is, what it’s used for, how it works in your brain, and how it feels when you take it. You’ll have access to dozens of clinical studies for each nootropic. Potential side effects and interactions with prescription medications. Recommended dosages and the best form of each supplement to buy. Head First is not just a materia medica of the most popular nootropic supplements used today. You get detailed recommendations for boosting cognition, executive function, all forms of memory, anxiety, depression, energy, motivation, and even brain repair and maintenance. One entire chapter is devoted to helping you evaluate the nootropics you need for your unique situation. This book is easy to understand. Even if you’re trying nootropics for the first time. But Head First will satisfy the most experienced neurohacker with detailed in-depth information. A book you can take to your doctor or naturopath when she asks why you want to try a supplement. With all the clinical evidence professional health care workers rely on to make informed decisions. You can read this book from cover to cover, just as you would a novel. It’s an engaging and interesting book. Believe me, this isn’t your average “power-up your brain” text. But you can also use the book as a reference. And I think most neurohackers will. You can read each chapter individually. You don’t need to read any particular chapter before any other. Each one stands on its own. Top 7 Brain Hacking Principles including “Choosing the Right Nootropic”, “Avoid Tolerance”, “Dosage and Synergy”, and “Evaluating Your Nootropic Stack”. How Your Brain Works delves into the microbiology of neurons, synapses, neurotransmitters and more. And how nootropics affect each. Nootropic Stack Recommendations explains which nootropic supplements you can use for faster thinking, alertness, energy and motivation. Through to the best supplements for dealing with anxiety and depression. Even how to repair things like traumatic brain injury, Alzheimer’s or stroke. Your First Nootropic Stack starts with the basics to get you going on your nootropic journey for a better working and higher performing brain. … the right combination of nootropic supplements saved my life. Now I want to share this with you. And it’s finally here. Normally a report or book of this professional quality would sell for up to $200.00. – but I want you to have this book today for only $47. If you order today, you will be among the first to receive an electronic version of my book for download right away. Up to now only close friends and family, and visitors to NootropicsExpert.com, have had access to my discoveries from this deep dive into the neurohacking world. They’ve seen and felt the evidence firsthand how nootropics work. Proven by biohackers around the world. Now I want you to experience this for yourself. 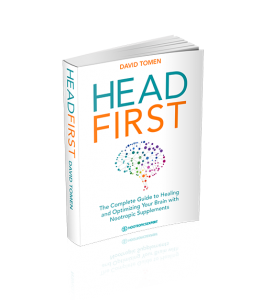 This digital version of Head First would be a welcome addition to any healthcare professionals library. But I assure you once you download it to your tablet, computer or phone. You’ll be referring to it often. Head First is an amazing book. One that I’m particularly proud of, and give much of the credit to sheer determination to just get better. And wow! Did I succeed. 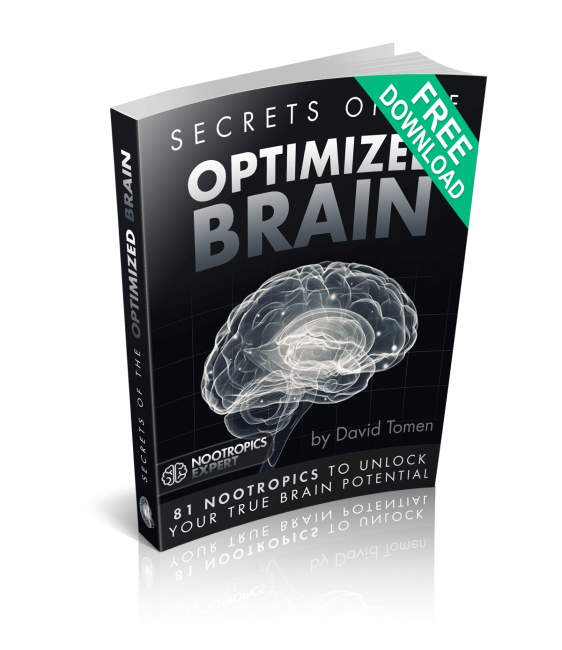 It’s nearly 600-pages, with hundreds of real, practical cures for healing and optimizing your brain. To help you and your family live a more active, healthy and vibrant life. You could get this information on your own. But you’d have to comb through thousands of clinical studies like I did. So for cost of a one-month supply of a high quality supplement, or pre-formulated nootropic stack, get Head First today for only $47! A digital-only edition, it is available for immediate download in PDF, .mobi and .epub formats. Please don’t wait. You have an opportunity to be one of the first to dive into the first authoritative book on nootropic supplements written in the last 20 years. Be at the top of your game for your next board meeting or VC presentation. Ace that important exam coming up. Be the kind of person you know she’ll admire on that next date. Put the fire back into your marriage. 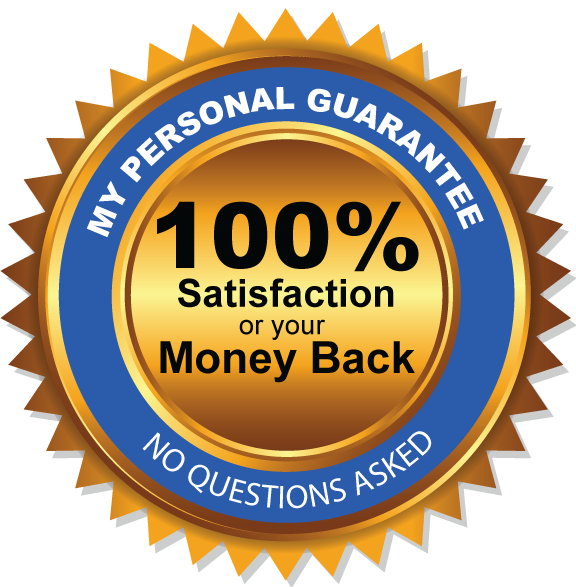 And you can be sure, if you aren’t completely satisfied with the value this book brings to your life, just return it for a full refund of your purchase price. I urge you to experience the healing power of nootropics today with Head First – The Complete Guide to Healing and Optimizing Your Brain with Nootropic Supplements. P.S. Even if you feel like you did when you were a kid, and don’t have any of the health or brain issues mentioned in this letter, these nootropic supplements can easily ensure you and your family NEVER get one of these diseases to begin with. And even if you or a loved one is in any stage of one of these modern-day health issues, these nootropics can help wipe out, and eliminate the symptoms of many of these diseases before they take hold and overwhelm your body and brain. Click here to get started. [v] Shorvon S. “Pyrrolidone derivatives.” Lancet. 2001 Dec 1;358(9296):1885-92.